After squeezing in one last summer recipe last week, I'm ready for fall. That means I'm ready for PUMPKIN! Pumpkin makes its fall debut this year in a recipe I've made more times than any other recipe on this blog, and given that I've made it almost every week for the past year and a half, I've made it approximately seventy times. I've also made about seventy variations of this baked oatmeal recipe. For the milk, I've used almond milk, coconut milk, skim milk, and 2% milk. For the fruit, I've used bananas, blueberries, blackberries, cherries, plums, pears, strawberries, raspberries, and peaches. Within the past year, I've experimented with other fun add-ins like flax seeds, chia seeds, and sliced almonds. Sometimes I used butter, sometimes I used greek yogurt. Eventually, I started adding another 1/2 cup of oats and milk so that one pan would last me a full 5 days worth of breakfasts. One thing never changes. It's always, always good. Making baked oatmeal is now part of my Sunday night ritual. No matter how much studying I have to do, I always make time for it. I've have the core recipe memorized. I don't measure anything except the oats, milk and honey, and I make it using only 1 bowl. 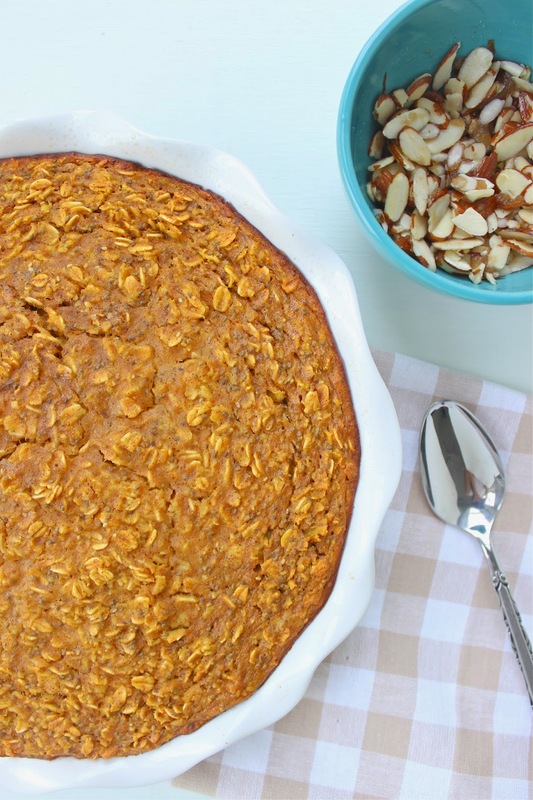 This baked oatmeal smells heavenly when it's baking. We live in a small townhouse, and the smell of whatever you're baking downstairs in the kitchen always wafts upstairs. I can't tell you the number of times Adam has come downstairs wanting to know what I'm baking. "Cake?" "Cookies?" "Nope, just my baked oatmeal." He always looks slightly disappointed, but I am NEVER disappointed with my baked oatmeal. I've converted several friends to my baked-oatmeal-ways, and now my mom and sister make it every week too. At my physical last year, my cholesterol was a little high. I have a family history of high cholesterol, but I think I live a fairly healthy, active lifestyle, so I was upset. My mom told me not to make any dramatic changes to my diet, so I decided to just add in more cholesterol-fighting foods, like oatmeal. At my physical this year, my cholesterol was 30 points lower. 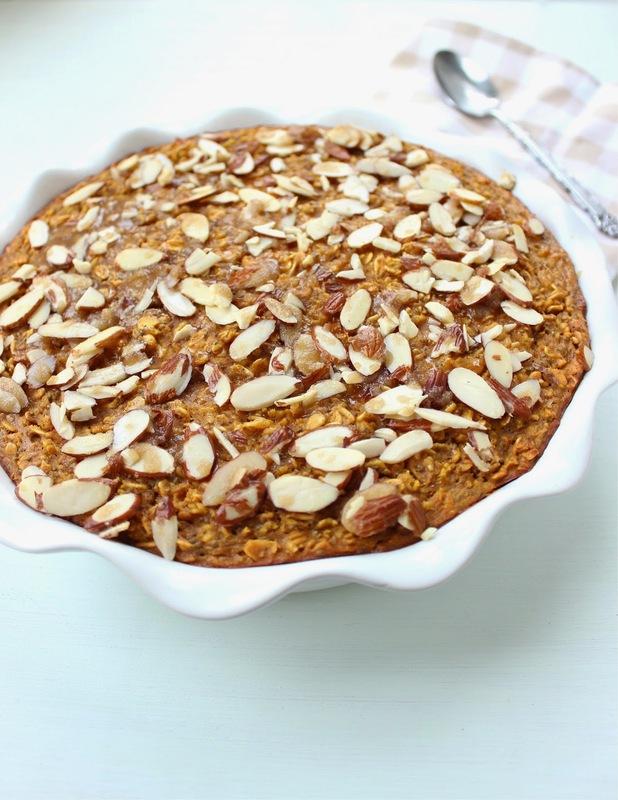 Miracle baked oatmeal? 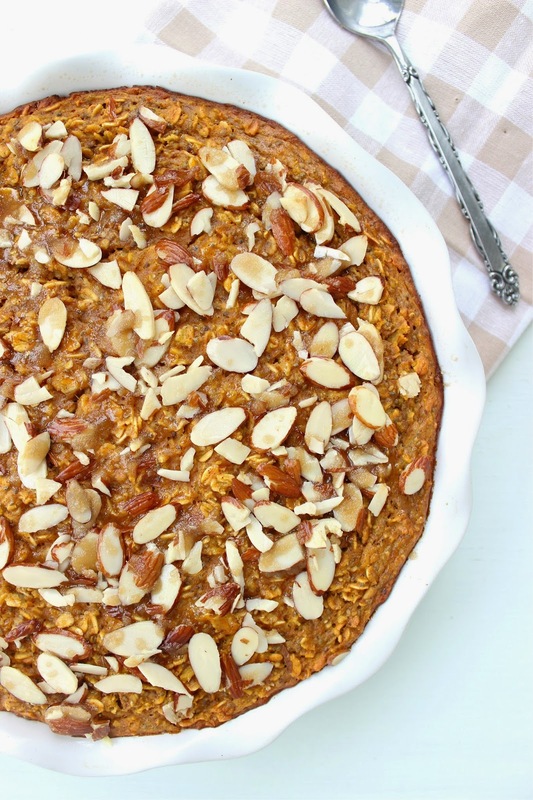 I make no promises, other than to tell you that it's a satisfying and healthy breakfast, and this pumpkin baked oatmeal with crunchy almond topping might just be the best version yet. It's basically pumpkin pie for breakfast, but totally healthy. The crunchy sweet almonds are an optional, but highly encouraged topping. This recipe would be perfect for a fall brunch, or a hangover recovery meal after a wild Halloween party. Or, for cozy Sunday evening baking to make your house smell like fall and your mornings just a little bit happier. Preheat oven to 350. Prepare a 9-inch pie pan or 9 by 9 inch square baking pan by spraying with non-stick cooking spray. 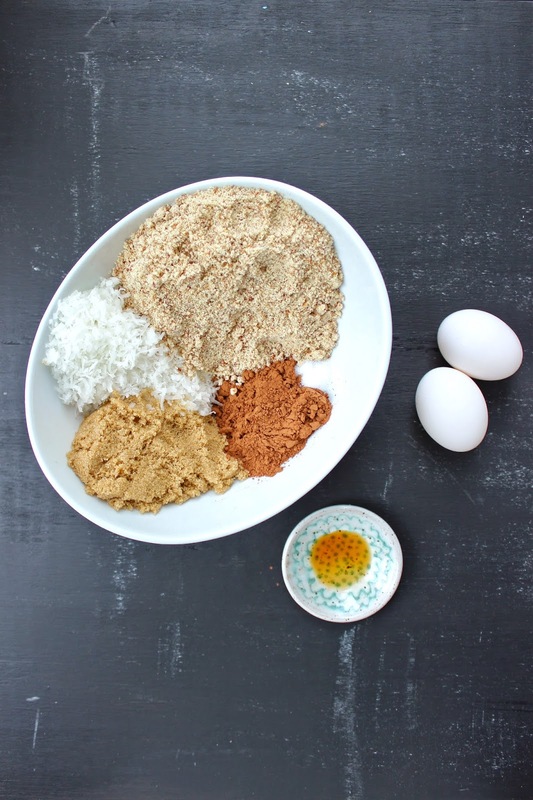 In a large bowl, combine the oats, chia seeds, baking powder, salt and all the spices. Stir to combine. In a separate, medium bowl, whisk together honey, vanilla, eggs, milk, pumpkin puree and Greek yogurt. Pour wet ingredients into dry ingredients and stir to incorporate. Pour into prepared pan. Bake at 350 for 40 minutes. While oatmeal is baking, add butter to a small bowl and microwave for 30-45 seconds until melted. Add brown sugar and stir to dissolve. Add almonds, stirring to coat in brown sugar mixture. Remove oatmeal from oven and sprinkle almond/brown sugar mixture over top. bake for an additional 5-6 minutes or until almonds are toasted. * You could also use 1 1/2 tsp of pumpkin pie spice instead of this mixture of spices. Want less sugar? Use plain Greek yogurt instead of vanilla. You can always add a drizzle of honey when you reheat individual servings. 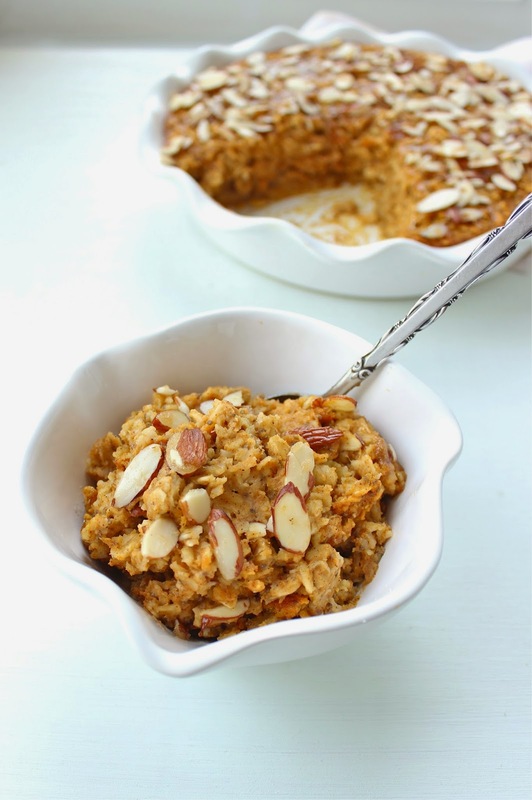 Mix it up--people like their oatmeal different ways, and this baked oatmeal is perfectly suited for that. When reheating individual servings, you can add more milk, butter, or sugar. To make it vegan--use vegan yogurt or substitute with 1/2 cup non-diary milk. Substitute flax or chia "eggs" for the eggs. Love pumpkin? Try my pumpkin biscuit cinnamon rolls or healthy pumpkin bread. 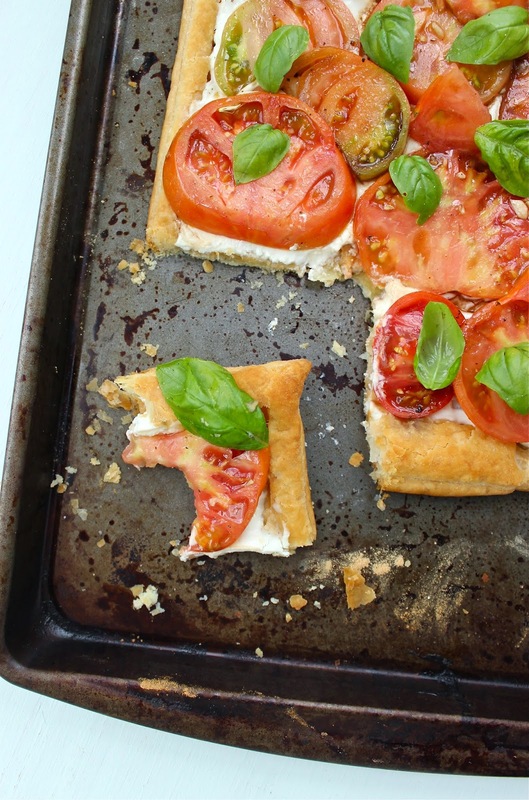 I'm sneaking in this fresh tomato tart on the laaaaaast day of summer and savoring every bite. I rounded up all of the remaining tomatoes in my garden for this tart, and then became obsessed with taking pictures of them because they're SO PRETTY. Even the inside is pretty. Right? Or maybe I'm just weird. My little garden has been one of my favorite parts of summer. 4 tomato plants. 4 pepper plants. Basil, rosemary, and mint. It's been an interesting journey for all of us--the baby bunny that lived under our porch, the snake that ate the baby bunny, the mosquitos, the weird-looking worm trying to eat my tomatoes, the hornets that decided to make a nest on our porch. We started out with baby tomato plants. My dad, an experienced gardner, told us that we needed to buy 6 foot poles to stake the tomatoes to. We looked at our spindly little tomato plants and thought "No, 5 foot poles will be fine." So we bought 5 foot poles. And by July we had 7 foot tomato plants. They hung on to those short poles for as long as they could, but then one too many strong summer thunderstorms came through, and I walked out one morning to see all my tomato plants blown over the poles in a sharp V shape. Not snapped, but bent. "That's the end of the tomatoes," I thought. "It was fun while it lasted." But they didn't die. They kept producing tomatoes. One day I tried to prop up the top of one of the tomato plants that had blown over when I realized it had rooted into the ground. I made another mistake by planting the basil in a container that didn't have water holes at the bottom. Thus the rain--from, again, too many thunderstorms--didn't drain out of the pot and overwatered the plant. I went out everyday for a while to try to drain some of the excess water out, but I eventually gave up when the basil made it very clear to me that it was DEAD. But, about a week ago, I was out picking tomatoes when I noticed 4 little basil plants growing in the ground. In the same area where I had been dumping out the excess water from the potted basil plant! They were healthy, and bright green, with plenty of pick-able leaves. These are probably everyday occurrences to gardeners or earth-science people, but they were little miracles to me. 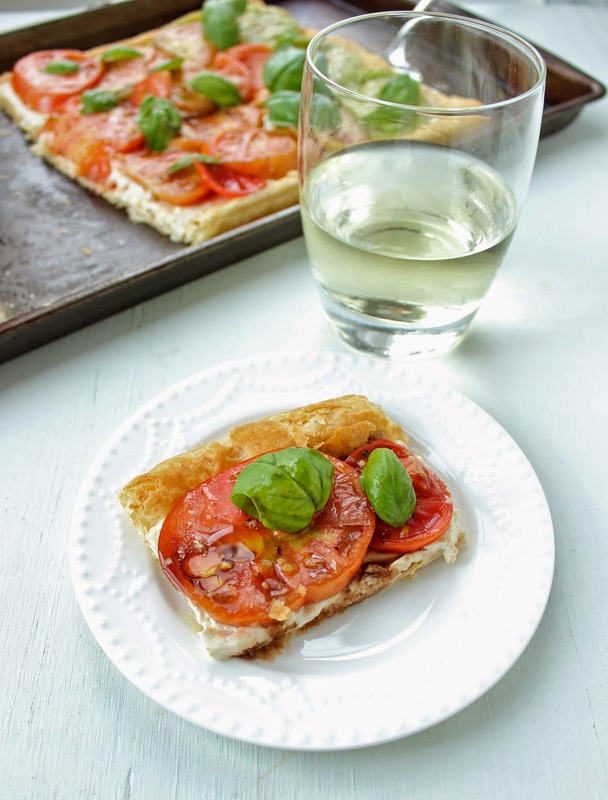 This easy tomato goat cheese tart, with its miracle tomatoes and basil, feels like a fitting way to close out summer. It's been a summer of some really happy moments, but to be honest, some bigger disappointments. Things that I planned and hoped and expected that just didn't materialize. But this tart, when paired with a glass of cold white wine and a friend to share it with, makes life good. And these miracle tomatoes and basil remind me not to be so preoccupied with loss that I miss the bright spots right in front of me. In a small bowl, whisk together balsamic vinegar, olive oil, brown sugar, and garlic until sugar is dissolved. 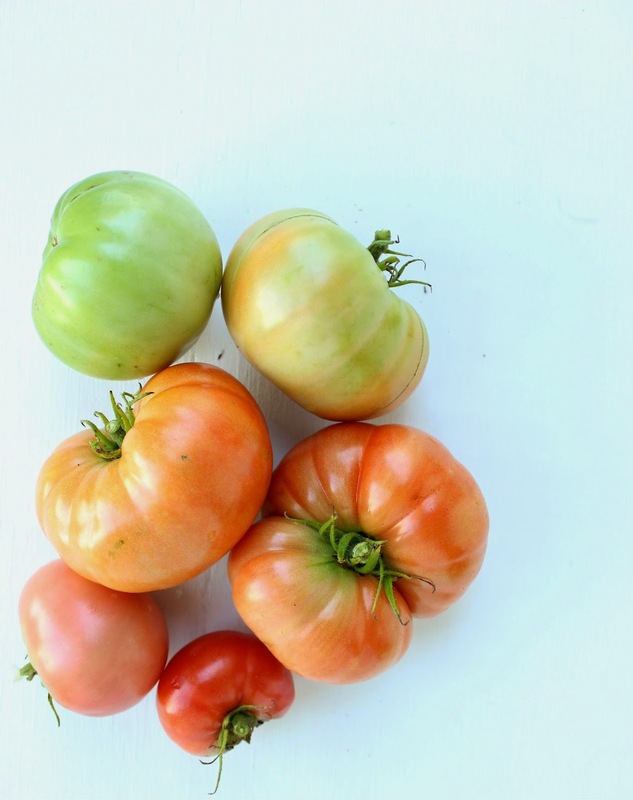 Pour over tomatoes. Let marinate for 15 minutes-1 hour as you prepare the rest of the tart. Prepare a clean surface on your counter. Dust with flour. Use a rolling pin to roll out puff pastry to a slightly longer rectangle. Transfer to a cookie sheet. Use a fork to poke holes throughout pastry, then use a knife to draw a line around the edges. Bake at 400 for 10 minutes. Remove from oven. Use a fork to press down the center of the tart if it's puffy. Meanwhile, let goat cheese sit out on the counter for a few minutes. Then, add it to a small bowl, along with a couple tablespoons of milk. Use a fork to stir the goat cheese and milk mixture until smooth, adding additional tablespoons of milk as necessary. Add salt and pepper to taste. Spread goat cheese mixture over tart. Bake at 400 for 5 minutes or until just heated through. Remove from oven. 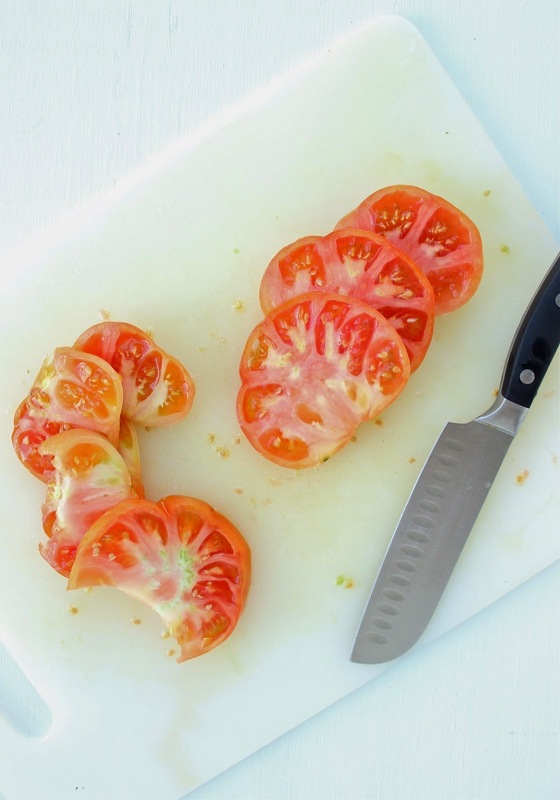 Carefully arrange sliced tomatoes over tart. If desired, sprinkle with fresh basil leaves and bacon crumbles and spoon leftover balsamic mixture over individual slices. Enjoy immediately! Tart is best eaten the day of. 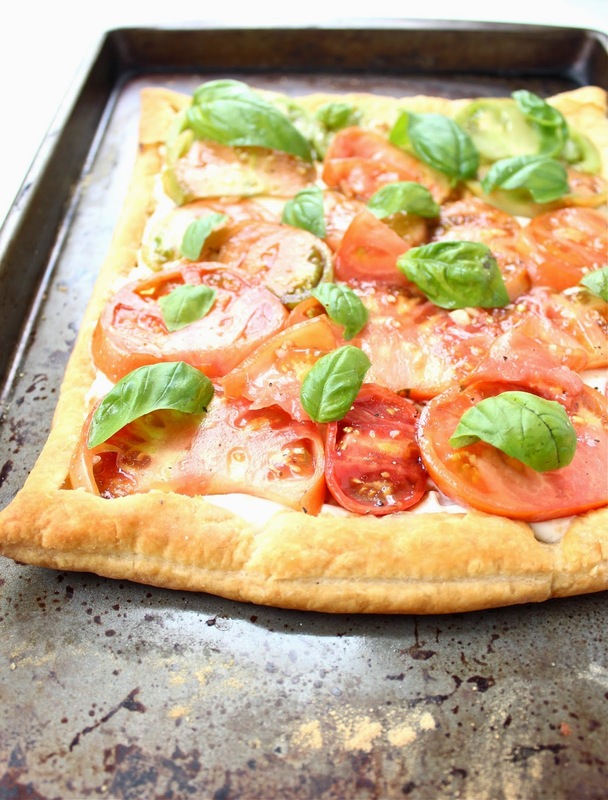 If you know you can't finish the entire thing, keep tomatoes in a separate bowl and just add to tart before eating. Otherwise, they will make the tart soggy after a day. 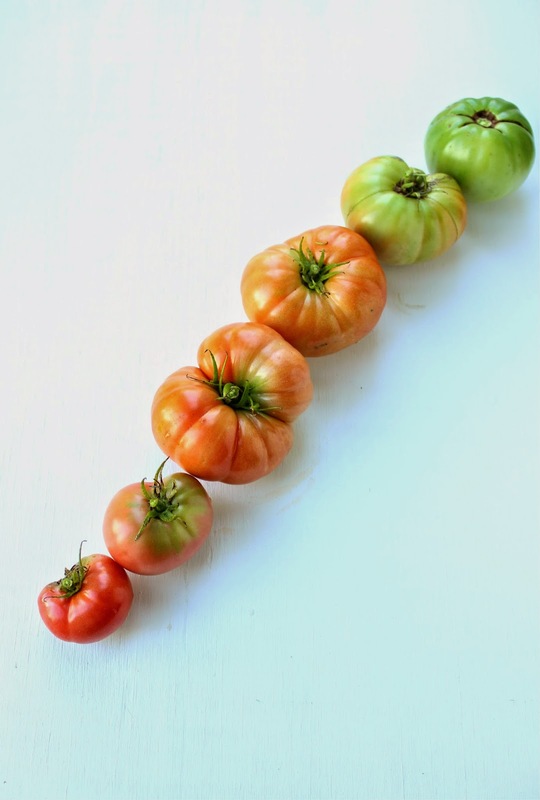 Are tomatoes out of season where you live? Try this tart with roasted butternut squash or caramelized onions and sun-dried tomatoes, or roasted mushrooms and brussel sprouts. The possibilities are endless! Love goat cheese? check out these goat cheese thumbprint cookies, these whipped goat cheese crostini, or this carrot potato tartin with goat cheese. Monday night, for the first time in weeks, I had nothing to do. I was caught up on reading. I had no upcoming deadlines for my jobs. I could have taken the time to get ahead on reading or work or house cleaning, but instead I made cookies. Story of my life. It was just one of those nights when I needed some chocolate. Have you been there? There was one small problem--the only chocolate in my house was cocoa powder. And friends, these cookies--> the secret to a really happy Monday evening. The original author said they were the richest, chewiest, chocolatiest cookies she'd had in a while, but I was skeptical at first. Only cocoa powder? No butter or oil? How could they be that rich? The secret here is the almond meal. 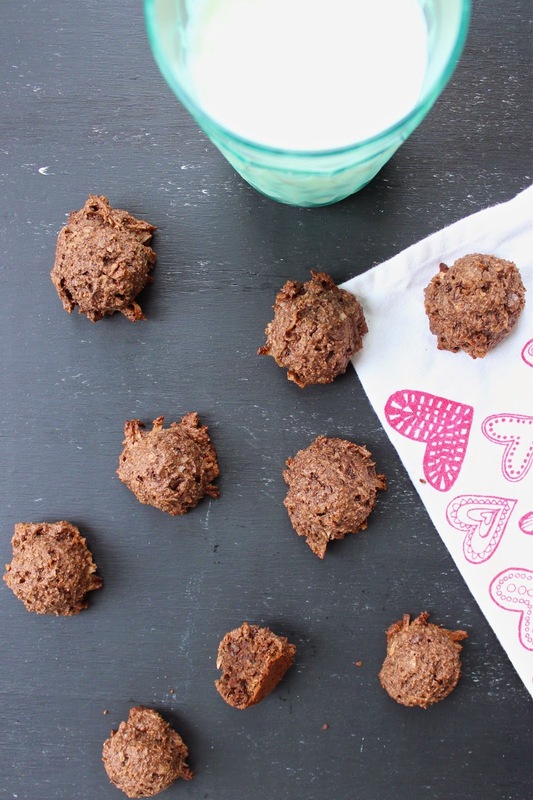 Something magical happens in the oven between the almond meal, cocoa powder and eggs. 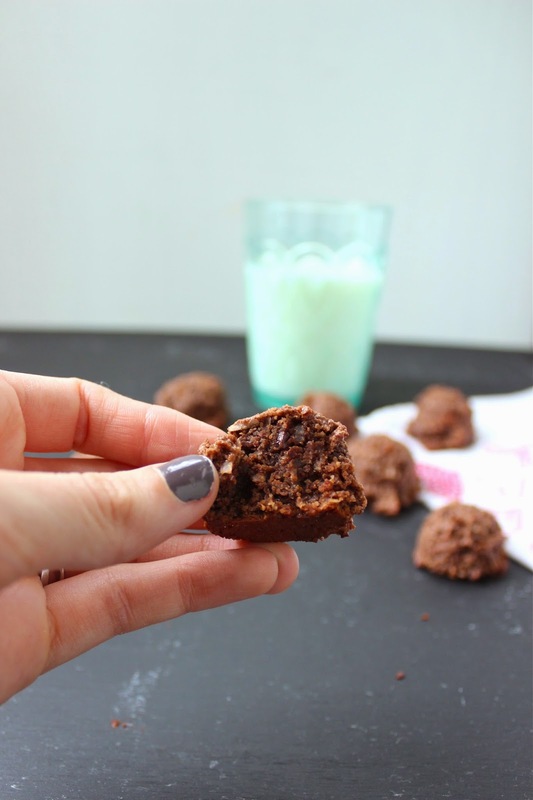 These cookies are fudgy and chewy and intensely chocolate. 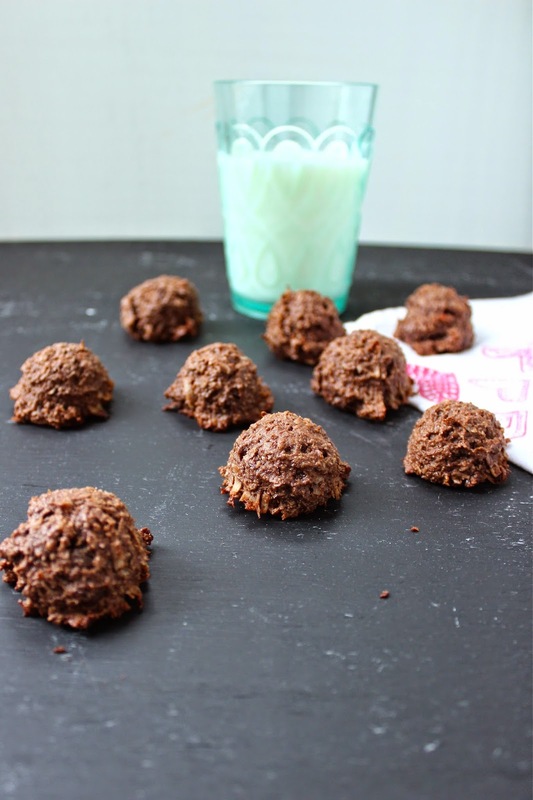 I like to think of them as a cross between a brownie bite and a coconut macaroon. I'm hungry just typing that sentence. I made these cookies on a Monday, and by the time Adam got home on Thursday, there was only 1 left for him. I make no apologies. They are that good. I made them again this weekend, (for official testing purposes, of couse) and at Adam's request I added some mini chocolate chips. They're not necessary, but when has adding more chocolate ever been a bad decision? I hope you try these cookies and that they bring a little brightness to your week, friends! Preheat oven to 350 and prepare cookie sheet with parchment paper or spray liberally with non-stick cooking spray. In a medium bowl, combine almond meal coconut, and brown sugar. Add eggs, vanilla, salt and cocoa powder. Stir to incorporate. 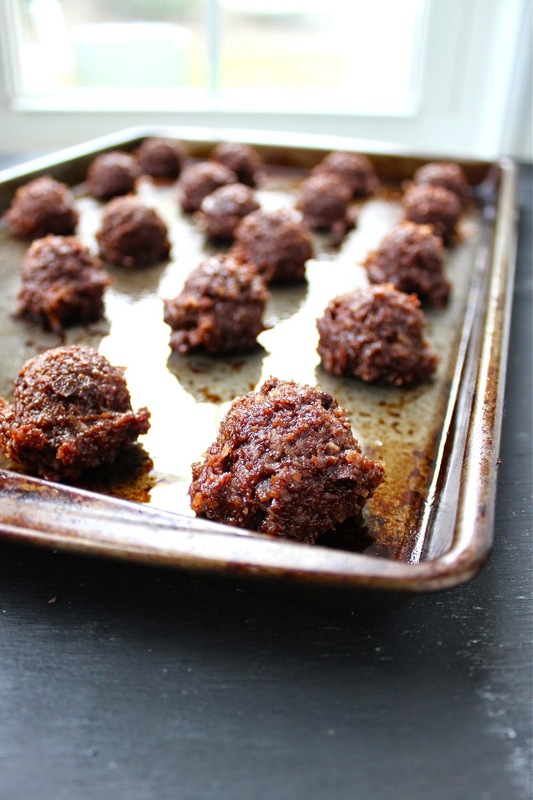 Roll dough into tablespoon sized balls and place on cookie sheet. Bake at 350 for 15 minutes or until bottoms are just slightly brown. Let cool. Cookies may stick to the bottom of the pan when warm. 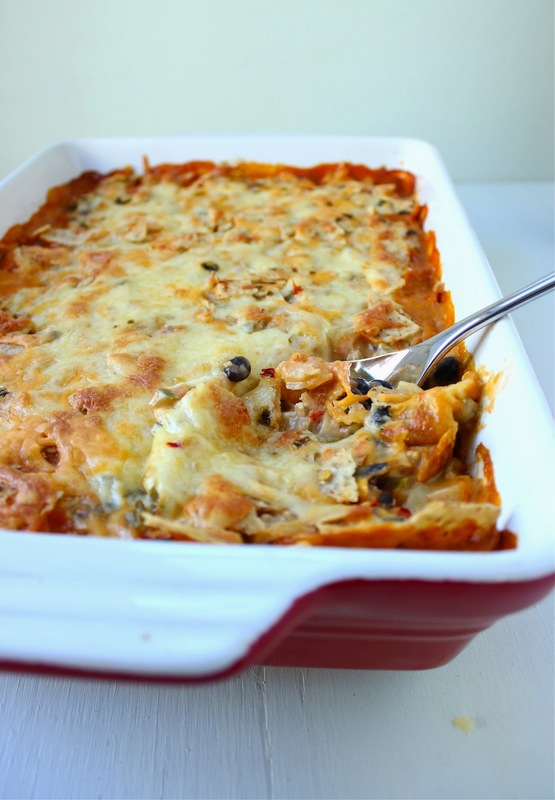 Hey, let's talk about casseroles. Do you find them comforting and reminiscent of home? Or unhealthy and filled with questionable ingredients like mayonnaise and cans of creamed soup? I didn't really grow up eating a lot of casseroles, and I might have once looked down on anything made with canned soup. But the truth is, it's hard for anyone to resist something creamy and baked with gooey cheese on top. Adam and I were in Texas last weekend visiting family and we were served a cheesy enchilada casserole. It was good. So good. That got me thinking more about casseroles. They do have some wonderful qualities. They're filling, and cheap for how many people they feed. They also freeze and reheat extremely well. 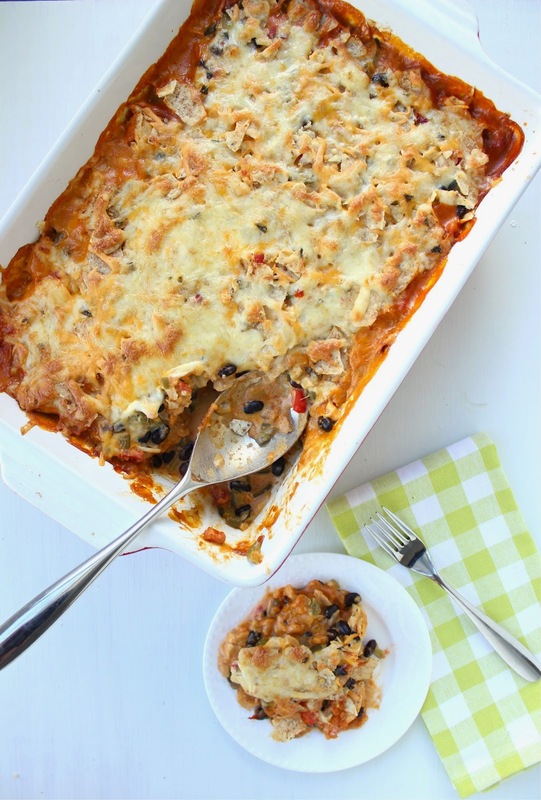 Could I make a healthy version of that casserole? Filled with lots of garden-fresh summer veggies and without any weird canned soup? This is definitely not diet food, but it is hearty, healthy, wholesome-ingredients kinda food. 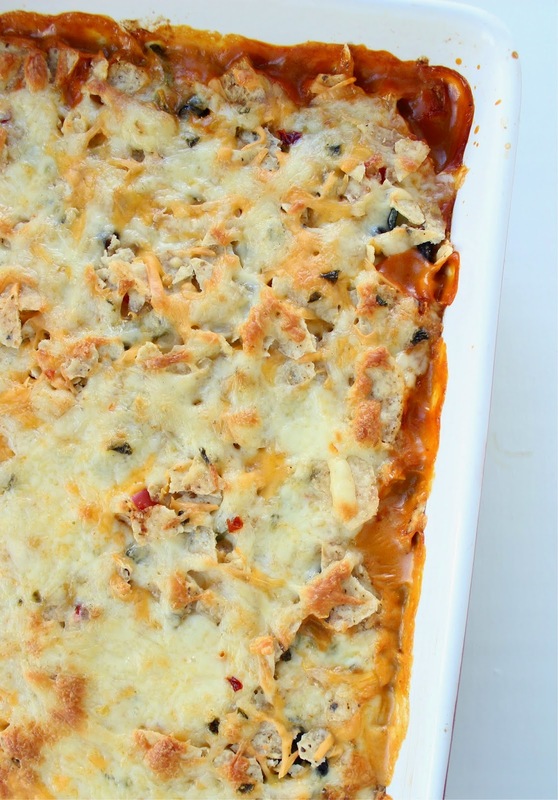 It's packed with more veggies than meat, beans for fiber, a little low-fat cream cheese for creaminess, and topped with a totally reasonable amount of tortilla chips and savory cheddar and pepperjack. True to its casserole form, this dish is also affordable and feeds a crowd. I'm loving the fact that it used up veggies from my garden and that it can be frozen and reheated for busy nights this fall, or dolloped on some lettuce for a taco-salad lunch. 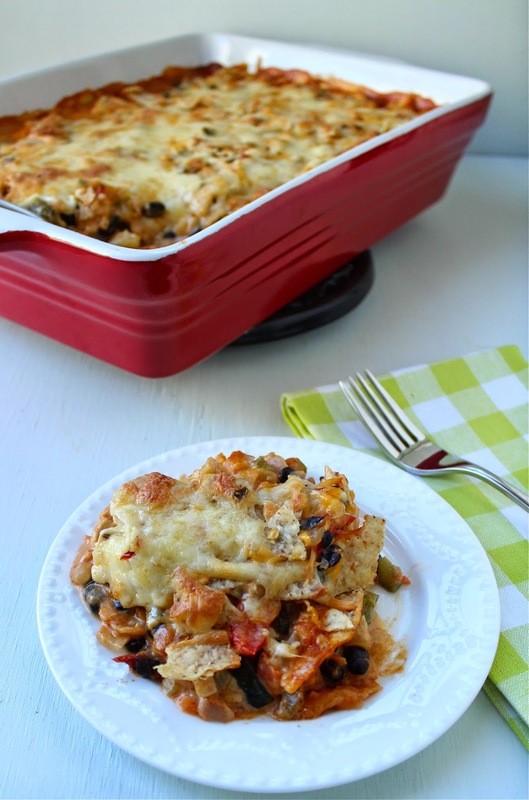 Healthy casseroles for the win. Also, on the topic of eating what you want, this article about women and food is well worth a read. Preheat oven to 350. Set out a 9 by 13 casserole dish. Heat 2 tablespoons olive oil in large sauce pan. Add onions and saute for 5 minutes, then add zucchini, green and red peppers, and tomato. Cook for 5-7 more minutes or until vegetables are slightly soft. Add cumin, coriander, chili powder, and flour. Stir for one minute, then add the chicken broth. Stir until bubbly and thick, then gradually add the milk. Cook until heated through and slightly thickened. 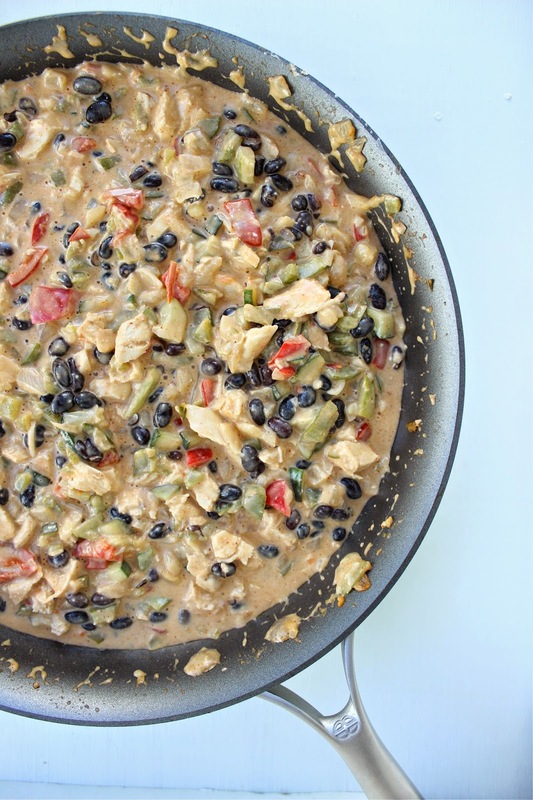 Turn off the heat and add cream cheese, beans, chipotle pepper, and cooked chicken. Stir to combine. Very important--taste and add salt and pepper as needed! There are a ton of veggies in here, so they need to be well seasoned. Also keep in mind that you will be adding tortilla chips and cheese later. Spoon enough enchilada sauce to cover the bottom of the 9 by 13 casserole dish. Add half of the chicken and vegetable mixture. Top with half of the tortilla chops and the rest of the enchilada sauce. Add the other half of the chicken and vegetable mixture, followed by the rest of the tortilla chips and the cheese. Bake at 350 for 30 minutes or until bubbly. To brown the cheese, turn oven to broil for the last minute of cooking time. If desired, serve with salsa, black olives, green onions, lettuce, and extra tortilla chips. To make more spicy, add hot sauce, or red pepper flakes, or hot enchilada sauce. To make gluten-free, use gluten-free flour. To make vegetarian, nix the chicken and add an extra can of beans or corn. Use vegetable broth instead of chicken broth. This could be a delicious and filling vegetarian meal!